Yellow, me again! I figured it was time for a catch-up and what not, and I’m sure you’ve all been dying to know what car I have now. Well, good news! For Mr Purple is still with me (*touch wood a few times*), and the worst thing that has happened is that I flooded his engine after my lunch break (still possible on some cars apparently), and had to be rescued by my boss (again). Not only that, but I’ve been receiving compliments about him, with people saying they prefer Mr Purple to other prospective cars! I’m as astonished as you are, but also weirdly proud of an inanimate object. So I’m a backpacker once more; after a cracking four months since I started my first proper full-time job (contract and all) in Dunkeld. 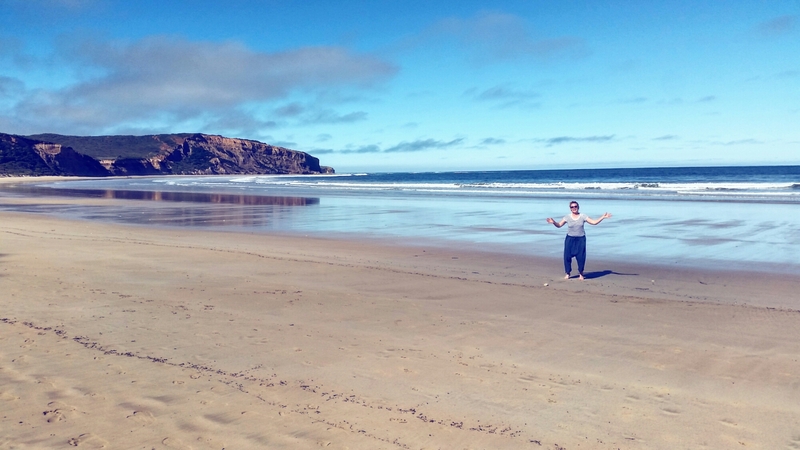 It was time to move on, I was getting itchy feet and, to be honest, I needed to head back to a beach. On the whole my Dunkeld experience was more highlights than lowlights. Nevertheless the lowlights tend to be more memorable… One of those ‘not so enjoyable moments’ (let’s not be too much of a negative Nancy) involves a particularly wet spring day, when all systems were go to finish landscaping the garden outside the new library before the big reveal. 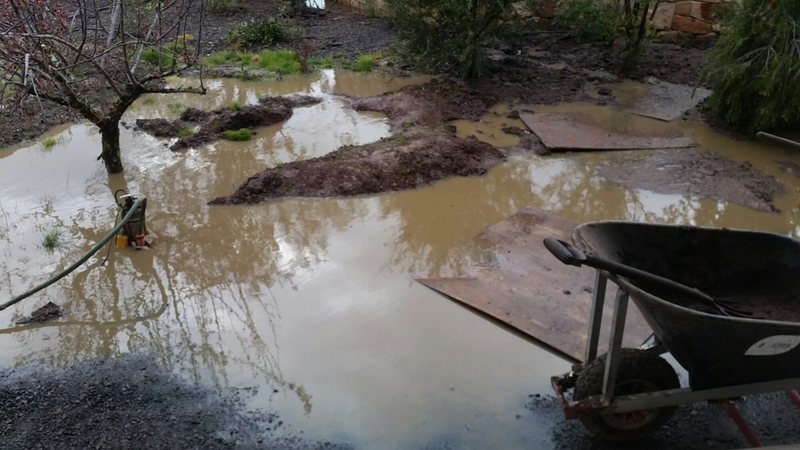 The ground was still uneven and full of holes after the builders had moved out, and therefore became the perfect place for water to amass. 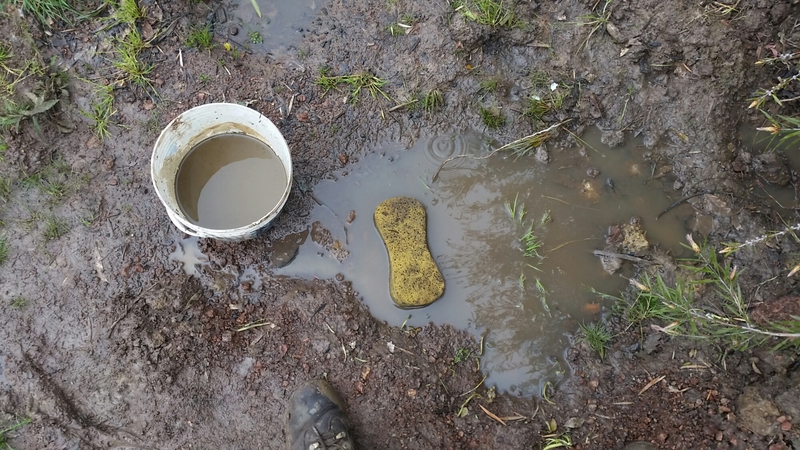 In order to level out the soil it needed to be dry, and having decided that the electric water pumps weren’t doing the trick, I was presented with a yellow sponge by my boss and told to drain all the puddles by hand, or should I say mini ponds. Let me reiterate, this was outside. While it was still raining. I think as bleak and futile tasks go, I reckon that this is in the top ten. In my eyes, it’s comparable to asking me to count the amount of grains of sand in a sand dune on a windy day. So hilariously stupid was this job that it made me envious of the Tradie who was cleaning the walls of the library with a toothbrush. Even he was laughing at/with me as I squatted in the mud, sadly sponging dry each puddle, which, due to the ongoing nature of rain, as you would imagine, all quickly and unforgivingly refilled. I had actually, three times. Was it the rain refilling the puddles, or my tears? Really though, who tries to fight Mother Nature with a yellow sponge?! Needless to say, I retold my day’s escapade to my housemate Emma in an effort to make her feel better about dying with a flu bug. I think it worked as she quickly gave me the nickname Spongey (a highlight), and Spongey I am for the rest of my days. Another thing that will stick with me is the amount of slice I ingested over the months, which definitely hasn’t done wonders for my waistline, and certainly not helped by our ‘cake-run’ Fridays… but when you work your socks off outside all day there’s nothing like a tonne of sugar to spike your energy and insulin levels. Plus, I needed the bodily insulation to keep me warm at night. Slice for survival I say. Slice up your life. Sugar and slice and all things nice. (Stop it Elly). SO, that’s enough of Dunkeld. 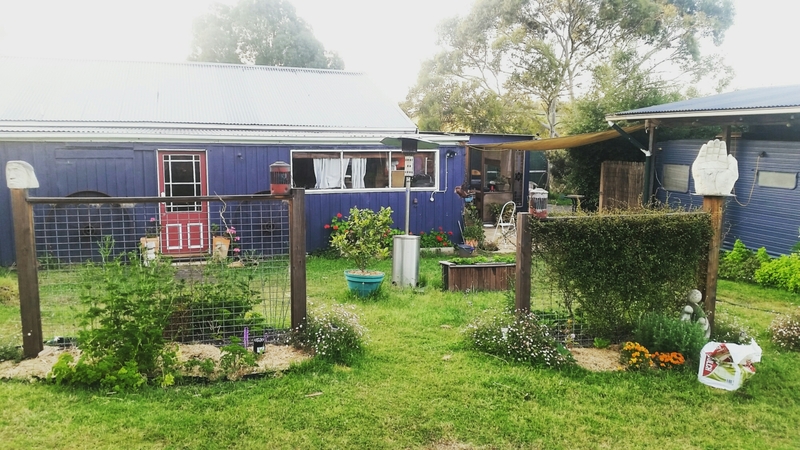 What with all the knowledge and things I picked up from the past few months, I decided to use my new skills to garden my way around Australia in return for food, a bed and some smiles, which is how I’ve ended up in a small village called Belbrae just outside of Anglesea and Torquay. Thankfully it’s a million miles away from its British counterparts (sorry not sorry), both in distance and appearance, and I’m gardening for a lovely couple during the morning and then beaching myself like a whale in the afternoon. Perfect. Once more, I’m burnt on my back in that small patch on my shoulder that I can never reach myself when sun-creaming, and sand is in every nook and cranny, all day, every day. It’s so great. 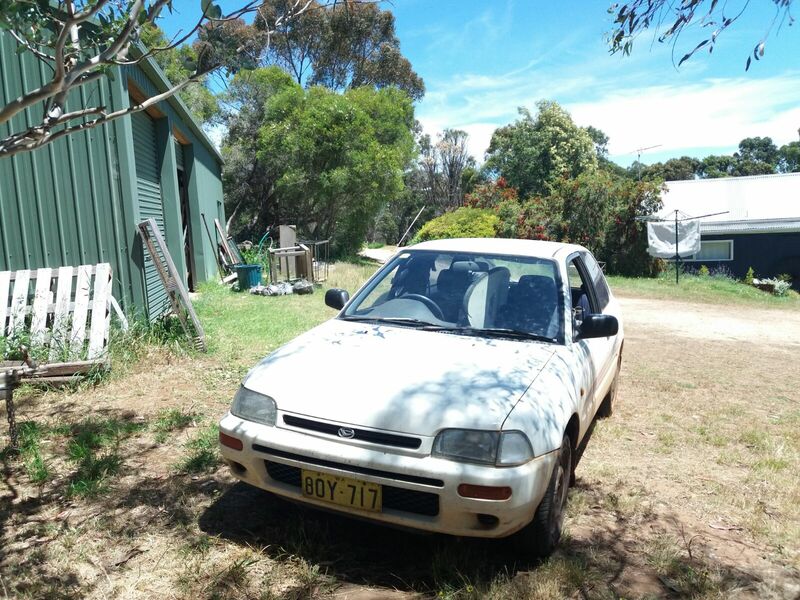 Although I don’t think I got off to the best of starts when, on my first night, a fox got in to the chook house and killed them all. Each and every bloody one. I confess, I had heard the squawk of chickens freaking out in the early hours, but I dismissed it as the rooster giving the hens a good going over (positive thinking and all). However, horror of horrors, the next morning we discovered four headless chickens strewn about the place and six more missing in action… Thus, the first task of my stay was to bag up the bodies, rake up the feathers and dispose of the evidence. I have to say I feel somewhat responsible, like I brought with me bad luck which somehow got passed onto the chooks, and as a ginger the odds aren’t entirely in my favour… Luckily Australia only really became established after that phase of panic burning witches/gingers/people with funny shaped noses. … … … Right? Michelle and Warren, who have let me come and share their home, are great and fun and not at all normal (thank goodness, all the best people are a little mad). Above all they let me run wild with the chainsaw and the whipper snipper, which gives me endless joy and fulfils my daily dose of petrol-play. 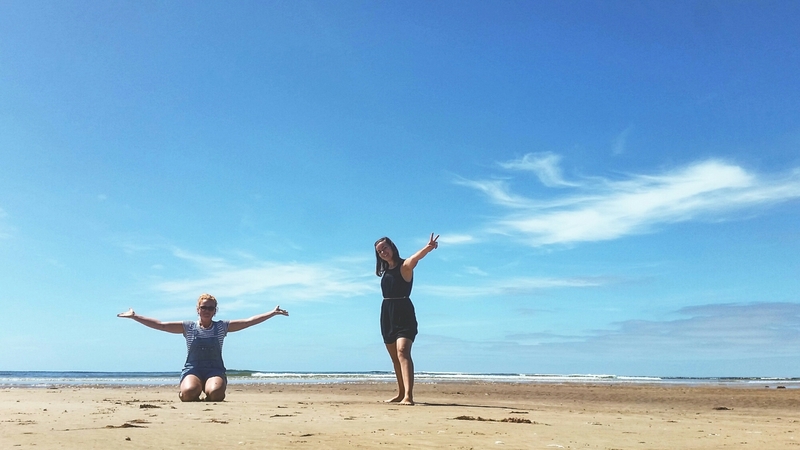 Two other backpackers are also staying here: one Austrian girl and one Dutch girl, Magda and Sesjena (hey guys!). As I already know about five words in German (mainly to say how much I love watermelon, ich liebe wassermelone), I’m putting my mind to learning useful dutch words such as: zakdoek (handkerchief), stofzuiger (hoover, or dust sucker if you will) and finally, khaasschaff (cheese slicer, apparently the Dutch don’t use a knife to cut cheese but a handy tool which creates the perfect slice, cool ey?). 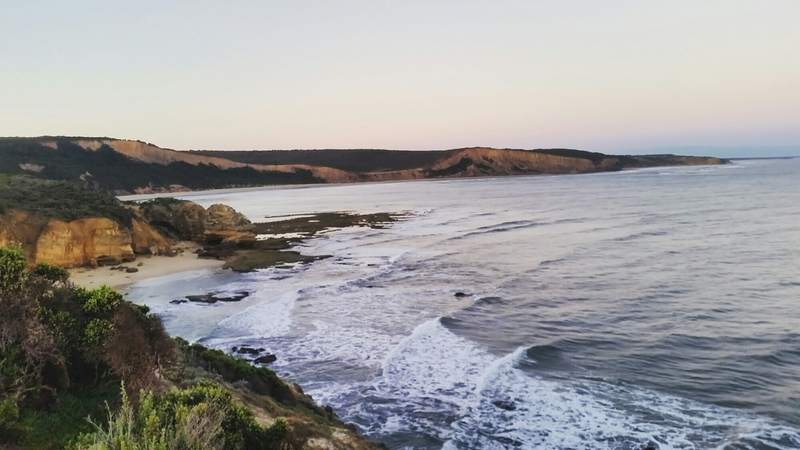 Belbrae is a pretty fantastic place to be, right at the beginning of the Great Ocean Road, surrounded by the most amazing sea, blue and clear and not a sign of overdevelopment. Saying that, I just looked up the English Torquay and Welsh Angelsea on Google and they are definitely not as grim as my childhood memory has painted them… apologies Torquaynians and Angelseanians. With all that said, I’m going to lurk here for a couple of weeks unless I’m told to go because I’ve overstayed my welcome! Or if something else witchey happens and I’m run out of town… On that note, see you in a few weeks/months, Auf Wiedersehen! Vaarwel! Toodle pip! You need to see it to believe it, this is a sponged puddle on the refill. Note the small bucket into which I squeezed the water… I emptied it countless times. This is what a puddle that has been sponged looks like once it has refilled, and then be rained on some more. Sunset at Point Addis on my first night. Warren and Michelle’s place in Belbrae. It’s really, really cool, and filled with Ukelele’s and odds and ends and joy. First day on the beach after many months in the rainy bush. Mr Purple in all his glory, proving that you can fit a surfboard in if you believe. Went for a stroll and was very surprised when I wandered into a bunch of naked old men, it was a nudist beach. 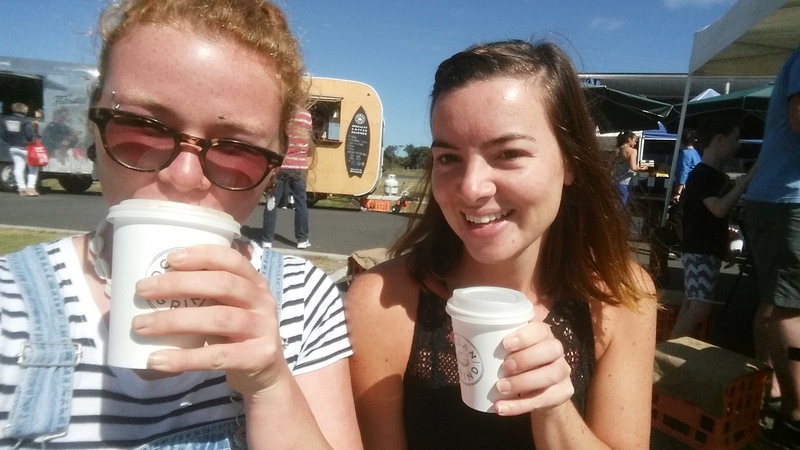 Local farmers market and coffees. Backpackers united: Magda, Sesjena and I showing that the EU is still alive. Previous Post Lanckeld, Duncashire, Ausland, Engalia. Next Post From Melbourne back to Perth, because West is best.